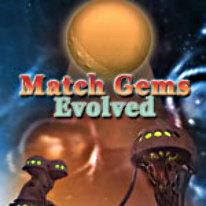 Discover a whole new way to play match 3 games in the entertaining puzzler, Match Gems Evolved. Discover a whole new way to play match 3 games in this entertaining puzzler. Enjoy a fun strategic gameplay to find harmony while travelling dazzling distant worlds. Play untimed for a true zen like experience and relax.